When I picture hot chocolate, I don’t picture drinks that are blue. 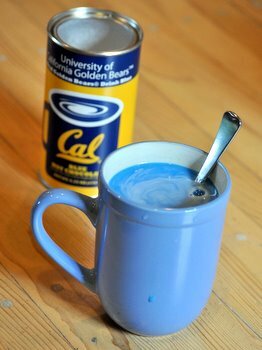 A friend of mine gifted me this container of University of California Golden Bears Blue Hot Chocolate because I went to Berkeley and they thought I might enjoy the novelty of it. The box promises that the hot chocolate will to turn bright blue when you add hot water to it – and it exceeded my expectations on how blue it was going to be! I assumed that this would be regular hot chocolate (which is to say, that the drink would be brown) with blue coloring added to it. Instead, this is a blue drink with chocolate flavoring! I can’t say that it going to beat out homemade hot chocolate or gourmet mixes like Godiva’s in a chocolate taste test, but it is fun to make and makes for a warm, festive way to support your favorite blue college or pro sports team. Naturally, I drink a glass when Cal is playing, but I’ll just hide the container and call it Dodger blue hot chocolate when I’m watching a baseball game next season.